With these character teeth you can easily change the look of your teeth to match your Halloween Costume. 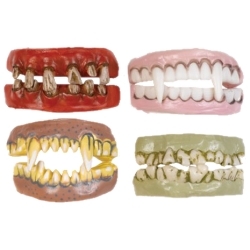 The character teeth are made of soft rubber for a comfortable, one size fits most fit. Available in vampire, pirate, werewolf, or zombie.